Here we are at the Labour Party Conference in Manchester. 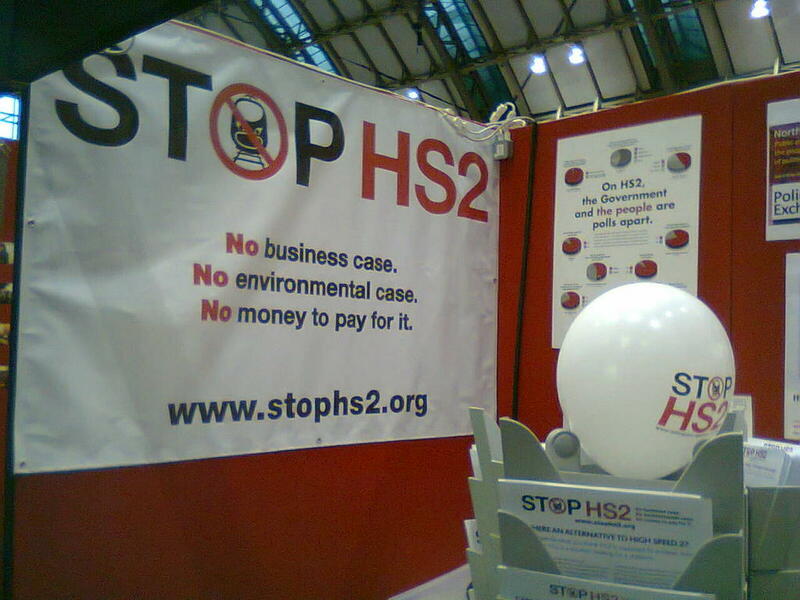 We’re at Stand 126, and there will be Stop HS2 supporters there during the entire conference. If you are at the conference do come and see us. Also remember our fringe event, on Tuesday 2nd October, 12.30 at the French suite in the Midland Hotel. we look forward to seeing you. Best of Luck but don’t hold out great hope of Labour or any Party taking notice. With Nick Clegg and, no doubt the other Leaders, actually passionate about Lord Adonis’s grand plan for the despoiling of some of England’s best countryside, towns and villages, signed off on a whim (being a privileged appointee, he had the power) as he packed his bags to leave post and at the time when Liam Byrne, presumably after a last look in the vaults, wrote his little note to his successor saying “there’s no money left”, and the buzzy bees now having to be seen to be taking action for the future and therefore following the buzz-word that is INFRASTRUCTURE, ie Spend, Spend, Spend, there is no chance that any of them will attempt to appreciate the havoc and damage the HS2 development will wreak, both in its construction and thereafter.